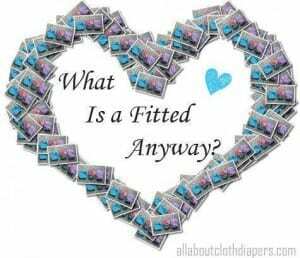 What is a Fitted Cloth Diaper and Why You Should Try One! Oh fitteds how I love thee, let me count the ways…Seriously though, I love fitteds. They are one of my go to options for night diapers. Paired with a wool cover a fitted is usually a bulletproof overnight option for many parents. But this is only one of MANY reasons that gaggles of parents love these things. First, let’s talk about what a fitted cloth diaper actually is. A fitted doesn’t have to be made out of any special material, so they can be made or are found in every cute pattern imaginable. Materials used are usually cotton, bamboo velour or cotton/hemp blends. Fitteds look a lot like a disposable diapers in shape and fit (but that is where similarities end). Fitteds become super popular this time of year. As it gets warmer, more moms start to let their littles run around in nothing but a diaper. They are very breathable and using them like this allows a little fresh air in to help dry things up. Fresh air is great in aiding rash prevention and remedy. One important thing to mention while your kid is running around in only a fitted….it is NOT waterproof. A cover will be necessary if you don’t want leaks. Another cool thing about fitteds is the ENTIRE diaper is the absorbent part. So it’s not just an insert absorbing wetness. That is why these make such a great choice as an overnight diaper. As I mentioned, these need a cover to be waterproof. Any cover will work, but I really prefer to use wool over fitteds. Wool is also very breathable and unlike a PUL cover, it will continue to allow air to pass. A wool cover will hold 30% of its weight in liquid and also naturally evaporates moisture to help keep things dry. Wool is not as scary as you think. It’s also a great option for people with sensitivity to PUL and other synthetic fabrics often found in standard cloth diaper covers. Yes, some fitteds can be expensive. They often require a lot of fabric and can be more time consuming to make. But you do have options. If you know how to sew, you can make your own! Check out this post for a few tips! Another, very reasonably priced fitted option is Kissaluvs. These fitteds start around $13-14. Kissaluvs Cotton Fleece Fitteds are very popular and happen to be one of the most recommended and loved newborn cloth diapering options out there. Still feel like fitteds are more than you can afford? Then please read this. It might help you find these are actually in the budget! Cute, made of all natural fibers and super absorbent! An infinite number of possibilities in fabric choices and patterns! You can find snapless, snapped and even hook and loop closures. There is literally something for everyone. If you haven’t ever tried a fitted, you might want to. But be warned you might love them so much you never go back to anything else! Keep your eyes open in the coming weeks! I have a few amazing fitted reviews I’m working on. 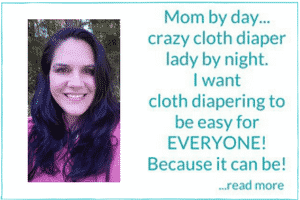 Also, a big overnight cloth diapering series that you won’t want to miss! Have you ever tried fitteds yourself? Do you have a favorite? TotsBots Bamboozle stretch, especially with the new TotsBots StretchyWrap over (best cover I tried to date, and sooooo much better than the old TotsBots wrap), really love this as a night time solution. And, was so happy to discover this tip: if an extra booster is needed, place it between the fitted and the cover – that way the fitted stays nicely snug around the thighs, and solids seem more likely to stay on the liner. I’ve only used Kissaluvs, but I really love them. I have twins in cloth and one is a super wetter, the fitteds can totally keep up with him. I love Motherease! I use a Motherease toddler and a Disana wool cover for my older child. Nothing was more absorbent and comfortable. I use green mountain diapers work horse fitted diaper. They are amazingly affordable and truly are a work horse! All cotton with snaps. I use wool cover (wraps, soakers, shorties) and never have a leak problem! I started with wool and flats on baby #1 but gave up because of the poo getting in the cover. It wasn’t until baby #3 that fitteds came in and saved the stash! Now I can’t go back to anything else. 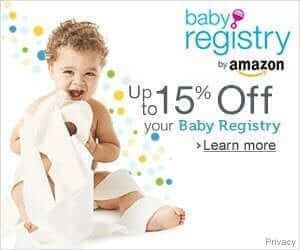 Also great for EC because you can feel if they have gone right away since we don’t use a cover around the house – just diaper and dress/shirt. Now I’m working on converting some flannel receiving blankets into fitteds for my newborn/small stash for baby #4! I’ve been cloth diapering my son for about 2 years now and just bought my first fitteds 2 weeks ago. I went with the Grovia kiwipie I think. My son is a seriously heavy wetter at night. They absorb soooo much. I think I’m going to have to get a wool cover though because even my sweet pea cover will leak with these sometimes. He’s amazing. Looking forward to potty training if it means no more huge diapers at night. My favorite fitteds are stay-dry. Not cotton velour or bamboo velour, but good old wicking jersey. My girls wake up when they feel wet, so stay dry is necessary for us. I’ve developed my own pattern and fabric combination for my heavy wetters, and I think it’s perfect!